Photo: Employees at Advania Norway. "We’re proud of this achievement," says Advania CEO Espen Hartz. 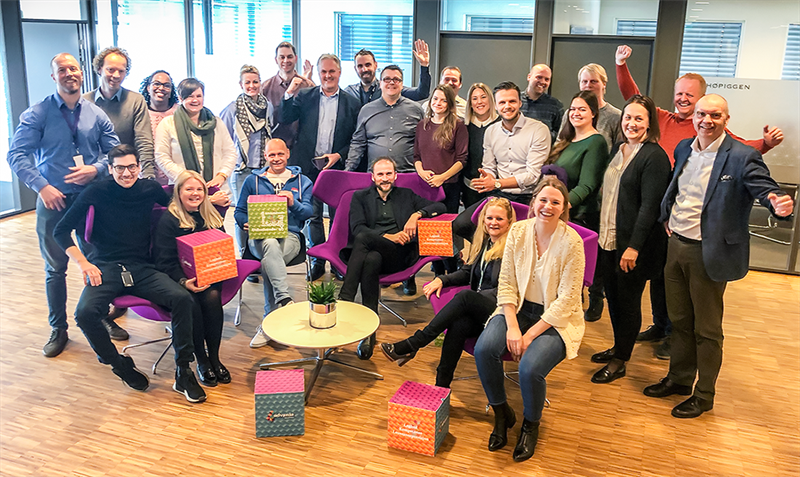 "We see this award as proof that Advania is a good place to work, that we are a facilitator for our employees and that we pay attention to them. A good work environment is important, not least for a company like ours, where hearts and minds mean so much for what we offer our customers. At Advania, work on our culture is a key factor in everything we do." Advania is undergoing considerable growth, both organically and through acquisitions. "To be able to cope with growth, it’s absolutely crucial that we take care of our staff – the cultural ambassadors. That culture is of crucial importance to our success in integrating new companies and new colleagues," explains HR Manager Silje Korshavn Grønstad. Advania welcomed 25 new employees in 2018, and we received over 300 applications. Further growth will continue in 2019, and new colleagues will receive a good welcome. Camaraderie and cohesion are evidently hallmarks of the company culture. Collaboration, sharing of expertise and team spirit also go hand-in-hand with the company's strategy for employee development. "Advania has shown good progress since its initial certification in 2016. There is no doubt that the company’s targeted work towards achieving a good place to work produces results," states Jannik Krohn Falck, CEO of Great Place to Work. According to Silje Korshavn Grønstad, there are three criteria for success when it comes to progress and good results. First of all, everyone must be involved in the work. "We always present the results for our employees and give them the responsibility for follow-up on specific measures. We don’t just perform stunts – we work on a dedicated and continuous basis." The second criterion is that the company must be fully transparent about the results and how it is working to improve the situation. "Everyone at Advania is able to follow the status of the work on our culture, see what measures are proposed and what has been decided. We’ve been following the same process since 2016 and that provides predictability." The third plank is commitment from the management group. "Great Place to Work is on the agenda at the management team's monthly meetings." The HR Manager sees Great Place to Work as a valuable measure of the trust-based corporate culture built up around employees’ relationship with the management, the job and their colleagues. Grønstad believes that Great Place to Work delivers an impartial assessment and is a tangible tool for working to make improvements. Each company is carefully assessed through analysis of anonymous responses to more than 50 questions, while the firm’s culture and practices are mapped, analysed and assessed via a Culture Audit. For the 16thyear in a row, the best places to work in Norway have been named. The basis for these awards is made up of the survey responses of over 30,000 employees at 217 companies. The surveys indicate that the best workplaces in Norway have an open culture where the management include the employees in important decisions, seek input and ideas and are perceived as open and accessible. In the best companies, 83% of respondents say that their management seek and give sincere responses to suggestions and ideas. This is 23% higher than the average for the question. The survey also indicates that the best companies are good at involving their staff in making the decisions that affect their work, provide opportunities for professional development and clearly demonstrate that they value extra effort at work. The companies at the top of the rankings are genuinely concerned with their employees’ welfare and well-being. Fully 79% of employees in the Norway’s Best Places to Work survey feel that their management show a genuine interest in them as people, not just employees; this compares with a national average of 55%. What is more, 81% say they feel that they are encouraged to find the right work/life balance, as compared with an average of 58%. 89% of employees in the top-rated businesses are satisfied with their company’s contribution to society, and fully 90% are proud to tell people who they work for. This compares very favourably with the national average of 71%.